Long experience with Peugeot cars has always been a bit of an adventure, especially the larger models that were veritable mileage eaters, people movers and load shifters. I am glad to report that sense of adventure is very much alive in the new Peugeot 5000 compact MPV I have been testing, a car that is certainly right for the occasion we are living in, a car that can be all sorts of things to all sorts of people and more seriously one that has the quality credentials to knock at the so-called premium market sector! While big MPV models have a defined place on the market (though possibly near its peak) these compacts are really starting to take off by providing more than satisfactory driving and performance qualities, and the potential to carry seven occupants (though sacrificing interior luggage space) or all sorts of people/load permutations from there on. This new contender takes up about the same road space as an average-sized estate car and proved far from cumbersome to handle, seriously comfortable from all aspects, hugely practical in its easy transformation from a seven-seater to a light van-sized transporter, a mobile entertainment centre and with the style to win a lot of street-cred contests. As a result of the efficiency of the modern car engine the overall capacities have notably shrunk and for the 5008 range there is nothing larger than a 1.6-litre petrol unit in two-power outputs or a choice of 1.6 and 2.0-litre turbo diesels with power outputs ranging from 107 bhp to 163 bhp. Three specification levels are offered – Active, Sport and Exclusive plus a useful list of options. My test car proved an interesting mix of the least potent 1.6-litre diesel coupled to a dual mode (Sport – Economy) 6-speed automatic gearbox and the top Exclusive specification plus a Video pack (£510), Connect Navigations system (£715) and very impressive Xenon Directional Headlights (£510). In theory this combination did not appear to promise much in the way of performance though in practice it delivered more than satisfactory results. 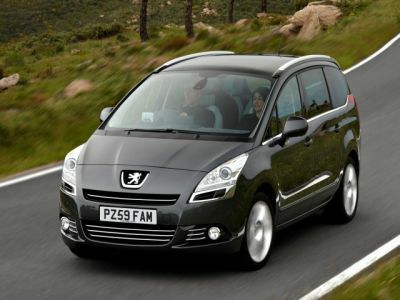 Peugeot claim a top speed of 112 mph with 62 mph (100 kph) reached in 12.6 seconds and a combined consumption of 55.3 mpg. Obviously any of these results depend on the load and the way the vehicle is driven and under general use it proved an excellent motorway cruiser with an amazing degree of quietness and ride refinement and with good pick-up in the intermediate speed ranges though the gearbox tended to hunt a bit if strong acceleration was demanded when the transmission was set in the Economy mode. It also proved a bit busy under the same circumstances in the Sport mode with gear changes coming more frequently. I don’t think that most owners would need to work this car as hard as I did during my test and for more casual driving the 5008 proved very competent and satisfying. Clearly a lot of that driving satisfaction comes from the excellent seating comfort, ideal driving position, impressive and cleverly presented fascia area (which includes a head-up system to project the speed in clear view of the driver) and the seriously good ride, responsive control and competent handling qualities. What is also important is that it drives small, the driver’s view pretty well unobstructed though one has to ‘learn’ the length of the rakish bonnet. Rear parking sensors are part of the package and so too is a secondary (small) rear view mirror to keep an eye on the rear seat occupants. Life inside this vehicle is a very pleasant (and exceptionally safe according to the high NCAP ratings), the accommodation in the second row of individual seats considerably better than a lot of Economy Class airline seats I have experienced and with the facility to slide and recline individually. Bring the final pair of seats into use and logically there may be the need to balance the seat spacings but even so those extra two seats are as good as found in the back of some small hatchbacks. Airline type picnic shelves are provided in the backs of the front seats, the TV screens are built into the backs of the front headrests and come with slip on covers for added security, the air conditioning/heating/ventilation system is highly efficient and has the versatility to ensure the well-being of all occupants. The standard fit panoramic glass roof on this Exclusive version adds to the feeling of spaciousness and the easy life is further enhanced by an extensive equipment package that also includes automatic folding mirrors, distance alert, tyre pressure sensor, cruise control with speed limiter, side sun visor curtains, rechargeable boot torch, USB and Bluetooth hands free kit but no roof rails. I strongly urge anyone considering an executive class vehicle to compare quality of the 5008 with any premium grade alternative – I suggest an eye-opener. Optional for publication - Rivals include: Citroen C4 Grand Picasso 1.6 HDI Exclusive £22,945, Renault Grand Scenic 1.5 DCI 106 Priv. Tom Tom £21,594, Ford S-Max 1.8 TDCI Zetec 6-speed £23,489, Vauxhall Zafira 1.7 CDTi Elite £23,925, Volkswagen Touran 1.9 TDI Promotion Match £21,980. Price from: £22,445 on the road. LAND ROVER: A Ski Weather Report service has been set up by Land Rover in conjunction with the Ski Club of Great Britain. The free report service can be obtained via the iPhone downloading on www.itunes.com/app/skiclubsnowreports.